I’ve spent the better part of the last week in Fort Worth, Texas, working long hours, enduring incredible heat and spending time with my youngest brother and his family. The 8-day odyssey to the place of my birth felt more like two trips in one. The first four days I was engaged in the annual meeting of the organization for which I work. The second four days, I was treated to a laid back schedule and the rare gift of time with my brother, whom I had not laid eyes on in two and a half years. See the family resemblance? With the guy in the hat, not the bass. The oldest of three boys, I have found it difficult to keep in touch with my brothers as our lives have gone in divergent directions. My family and I ended up in Atlanta, my middle brother and his family live in Lake Wales, Fla., and my youngest brother and his family are back in Fort Worth after a two-year stint in Junction, Texas. I do okay keeping in touch with my parents, who serve as connectors for the three of us, but there is no substitute for spending time one-on-one. Lyle is 10-and-a-half years my junior. He was entering second grade when I went off to college, and for the next 24 years, we’ve only had stolen moments to spend together: spring breaks, Christmas holidays, occasional shared family vacations and rare business trips that took me to his neck of the woods. And because of his family’s transitions the last few years, we haven’t even been able to get together at Christmas. This lack of a relationship with my brother affects me in ways I don’t like to think about. While Lee – the middle brother – and I catch up at Christmas as the grounding point for our relationship, Lyle and I have missed out on that altogether. And unlike my weekly routine of calling my parents, with Lyle there is no consistent time that our schedules converge to allow meaningful conversation. So we rely on Facebook to keep up with the daily events of each other’s lives, a weak substitute for an actual relationship. This week went a long way toward helping to bridge the gap between us. As we toured the Fort Worth Stockyards, worshipped together, visited the national scouting museum, took in the giant Cabela’s store, swam with our kids and beat the 100-plus-degree heat with a dollar movie, our conversation was easy, genuine and full of the respect and affection brothers often feel but rarely express. Typically, brothers express their emotions with a slug and an insult. Lyle and I simply don’t have time for that. When we’re together, we have to connect in meaningful ways or else we could completely lose touch. 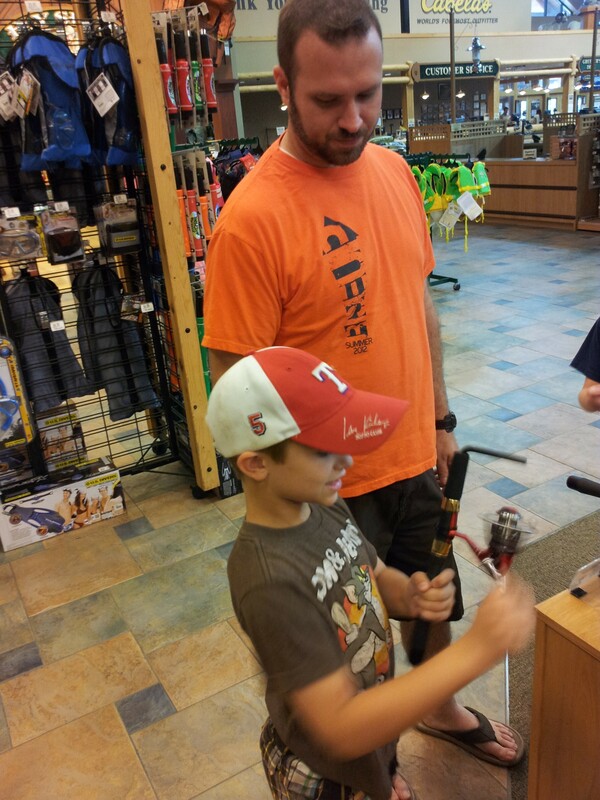 Lyle and his 7-year-old son, Haydn, try out reels at Cabela’s on Tuesday. That’s what struck me so much about our time together this past week. I was able to relate to Lyle, not as my little brother, but as a minister-in-training, parent, tour guide and friend. Yes, we spent some time around the table telling stories on each other, and on Uncle Lee, much to our children’s delight, but the inadvertently weakened bonds of our brotherhood were strengthened just at the time they needed it most. I can’t remember a time that Lyle and I have been at odds, but that’s because we’ve been so distant we haven’t had a chance. I don’t want to pick fights with anyone, least of all my brothers, but I would trade a few disagreements for a closer relationship. So as my summer heads into a middle stretch between trips, I’m back in my comfortable routine. I’m just going to commit one more time to find a way to not lose touch with both my brothers as life unfolds. There’s simply too much to be gained to let go. How do you keep up with your siblings? Have you recently been able to share in some quality time with your brother or sister? Leave a comment below and share your secret to staying connected to your siblings. This entry was posted in Uncategorized and tagged Boy Scouts of America, brother, brothers, Cabela's, children, contemporary South, Cub Scouts, family, fishing, Fort Worth, keeping in touch, Lake Wales, Lance Elliott Wallace, Lance Wallace, Lyle Wallace, national scouting museum, New South, New South Essays, NewSouth, parenting, relationships, siblings, South, Southern, Southern Culture, Southern Living, Southerners, stockyards, Texas, Texas heat, the South, travel, trip to Fort Worth, vacation. Bookmark the permalink. My late brother was 12 years older and my sister in Fernandina Beach is 10 years older. I wonder if it was as hard for Lyle to see you go as it was for me when first my brother went off to college and then my sister married and moved far away when I was 8. The house became quiet, I became an only child. Wonderful essay, Lance. I have six younger siblings and we are all scattered across the country and across the Atlantic.It is difficult to maintain close ties but keeping in touch is very rewarding.I am excited that most of us (5 out of 7) will be together for my youngest brother’s daughter’s wedding on the 14th of this month in St. Simons , Georgia. I’m so glad you got to be with Lyle and his family. That was an added blessing to your trip. Thanks for this article. I have 3 younger brothers. I am 13 years older than my youngest. So, that brother is actually more like a brother to my olderst child than to me. Having lost the oldest brother, (15 months younger than me) 4 years ago, your article hit home. We let life and distance get in the way. My two remaining brothers and I did sort of commit to keep in touch more often. That works for the middle brother, Zane, 7 years my junior, as he lives in Tampa and our mom lives with us. That forces him to visit more often than if Mom were not here. My youngest brother, Tommy, lives in Maryland. So, while we don’t get to see one another still as often, we now keep in touch through his wife and facebook. But the recent death of Tommy’s oldest son, Noah, this past year has him struggling to get past it and has called for my brother, Zane and I to reach out to him. Zane has been through and still going through grief counseling through his church because of the death of his stepson to a motorcycle accident (which is the same way we lost Noah in November 2011) and then the death of our brother, Chuck, in September of 2008, has given him first hand knowledge of what Tommy may be going through and hopefully will be able to spend some time with Tommy this summer to help him. So, all that to say, none of us know how much time we have and we should take every opportunity to say I love you, I am thinking of you, I am praying for you. Thanks Lance. 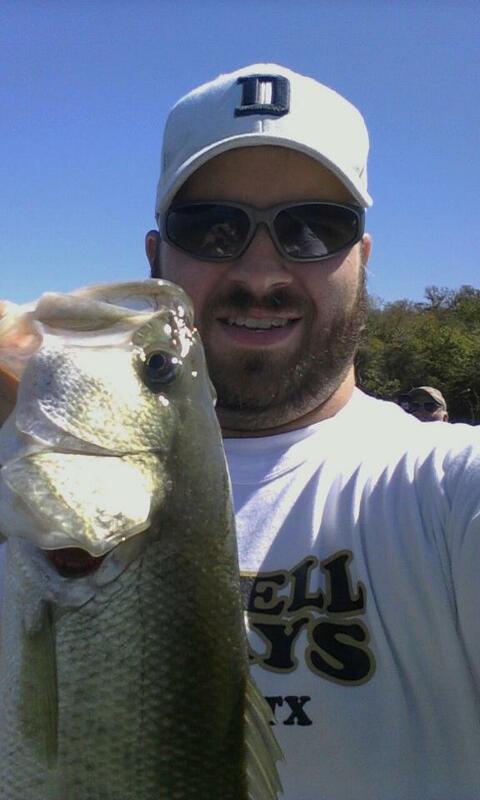 Compared to the pic w/ the bass I think Baron looks alot like your brother. Skype is such a gift when it comes to keeping up with Andrew!